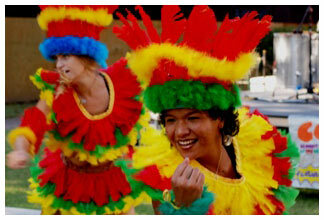 Ready to experience beats like the samba, an evening of dancing and mouth-watering Brazilian foods? The “Brasil Sensacional!” event April 18 at 6 p.m. boasts live music and performances from New Orleans-based traditional Brazilian dance troupe Casa Samba. The event is not only a fun evening of Brazilian culture—it’s also an opportunity to support international students studying at Loyola University New Orleans. The fundraiser is set for the St. Charles Room, located in the Danna Student Center on Loyola’s main campus. Proceeds will benefit the International Student Scholarship Fund, which awards scholarships to international students at Loyola on F-1 visas. More than 100 international students come to the university on F-1 visas each year, but these students are ineligible for most need-based financial aid, which funnels through the U.S. government. Tickets are $10 for students, $20 for Loyola faculty and staff, and $30 for general admission. Tables of nine are available for $200. Loyola’s International Student Association and the Center for International Education have sponsored the International Student Scholarship Banquet annually since 2001. For additional information or to purchase tickets, contact the Center for International Education at 504-864-7550 or cie@loyno.edu. *All photos by Wadner Pierre.